This is a short overview of the functions RealmEye offers to logged in users. You can tag players on their RealmEye page. Below their description you&apos;ll find a small button with a tag icon. Clicking that button opens a dropdown menu with actions to add or remove tags. For each tag there is a page with the list of people tagged by you. Marking somebody as a Friend plays a role in the visiblity settings. Various parts of your profile can be set to be only visible to whom you&apos;ve marked as a friend. There is also a MrEyeball command, with which you can list your recently seen friends in the game. When you Ignore other players, their messages sent to you via RealmEye will be Archived automatically. You should tag players as Scammer, if they scammed you during in-game trading. People who get tagged a lot may have their offers marked. You can also toggle this tag with the tag and the untag MrEyeball commands. Tagging people as Cheater doesn&apos;t have any particular effect, besides that you can see them on your list. You can also toggle this tag with the tag and the untag MrEyeball commands. 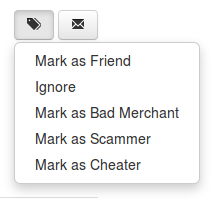 Offers by Bad Merchants will appear at the bottom of the list for you, and they will be grayed out. On your profile&apos;s Settings tab you can now control the visibility of your profile and parts of it. Those who can&apos;t see your profile also won&apos;t see your name in any of the rankings, or in your guild page. But if your profile is not visible to everybody you won&apos;t be able to use RealmEye&apos;s trading section. Who can see my Characters / Pets / Fame History? 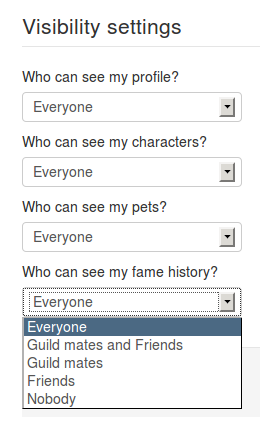 Those who can&apos;t see your characters / pets / fame history, but can see your profile, will be able to navigate to your profile, but won&apos;t see your characters / pets / fame history tabs, and also won&apos;t see your characters / pets anywhere else on RealmEye. Every visibilty setting has five possible value: Everyone, Guild mates and Friends, Guild mates, Friends, Nobody. On your profile page there is a Messages tab. The number on the flap indicates how many threads has unread messages. If you are rank 4 and above, you can start new threads by clicking on the New Thread button. To start a new thread you need to supply a subject, the participants and the thread starting message. You can read threads by clicking on the subject. At the bottom of the thread page you can write your replies. There is also a Message tab on your guild&apos;s page, threads started there can be seen by all current guild members.